MadAppLauncher is a free tabbed launcher tools that is designed to quickly access to all favorite programs, documents, and folders. MadAppLauncher supports up to 10 different tabs of which each tab has 30 slots that can hold program, file, or folder shortcuts. With MadAppLauncher, users can use tab groups to reduce cluttering on desktop or task bar, have quick access to applications, navigate and launch an application using the keyboard, tweak all settings easily, and have ability to drag and drop apps onto it. 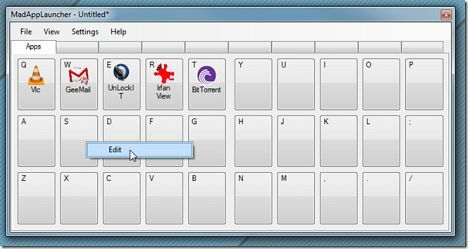 In addition, MadAppLauncher also allows users to customize UI and create hotkeys for commonly used applications. Assign 30 programs for each of the 10 tab pages. A total of 300 per configuration. Organize better by assigning a configuration file to a button – effectively creating a cascading set of programs. Auto-hide window when an application, file, or folder is opened. Drag and Drop applications, files, and folders. Change an application initial location and size. Save multiple sets of applications. Duplicate applications assigned to buttons. Auto Activate Tab on mouse over. Option to press key twice before launching. Refresh icons for portable applications, files, and folders. Currently MadAppLauncher is compatible with Windows XP, Vista, and Windows 7 and is available for free download through official site or direct download link below.